Scandinavian interior design - of “Scandi” as we like to call it – is one of the hottest trends right now. Unlike many other trends, this classic cool style has a timeless quality that helps it remain functional and beautiful long after Scandi is out of the spotlight. As the inventors of Ikea, as well as many popular interior design trends, Scandinavian people take great pride in their furniture. The crux of scandinavian interior design is clean lines made from natural materials, often with a mid-century modern twist. Furniture is functional, with comfort at its heart and clever storage and dual purpose solutions. In some parts of Scandinavia, there are only a few hours of daylight a day during the winter months. Lighting is vital to creating homes that are inviting and warm. Choose modern designs that have a touch of the industrial about them, and make sure to include lighting sources for different heights across the room. Candles such as votives or candelabras add a romantic feel. Scandinavian interior design focuses on clean, relaxing spaces decorated in neutral, natural tones. Because of this, clutter is a big no-no. Luckily, proper Scandinavian furniture incorporates clever storage solutions to ensure clutter can be kept off surfaces. When you experience a polar winter, you’re going to want a house that feels cosy and warm. That’s why a huge part of Scandinavian interior design incorporates thick, warm textiles like furs, sheepskin, and mohair. You’ll see rugs to divide and delineate space, and throws over chairs and beds to act as inviting signals of warmth and cosiness. While the Scandinavians like to go all out with the fur and sheepskin rugs, you won’t see heavy drapes or fussy window details. That’s because in houses with small windows that get very little sun, the more natural light that comes in, the better. No one wants to block the precious sun with fancy curtains! Opt for simple shades in light fabrics (such as linen) where needed. In most areas, avoid window coverings altogether. Scandinavian interior design is a beautiful look, but pulling it off requires the patience and skill to match the right colour palette and source the perfect pieces. 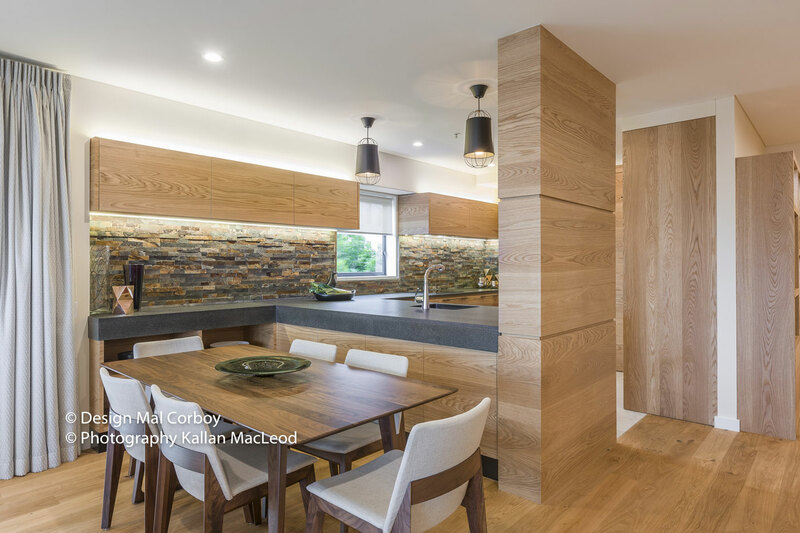 If you don’t know where to begin with your interior, then let critically-acclaimed interior designer Mal Corboy show you how he can transform your home. Contact Mal for a no-obligation consultation today.